Saybrook University faculty members Ruth Richards and Steven Pritzker were keynote speakers at the New Zealand Creativity Challenge on April 17-19, showcasing creativity across multiple fields in Lower Hutt, Wellington, New Zealand. 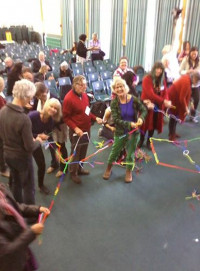 The theme of the conference was “Creativity Crosses Boundaries,” and was sponsored by The Learning Connexion, a school of creativity and art in Wellington led by Jonathan and Alice Wilson Milne. Almost 300 participants attended the conference. Presenters came from New Zealand, Australia, England, and the United States and also represented various cultural and indigenous groups (including Maori and Samoan presenters from New Zealand and a member of the Itazipco Band of the Cheyenne River Sioux Tribe from the U.S.) The event opened with a traditional Maori welcome ceremony that honored this international coming together, crossing of boundaries, and spirit and deep sharing of this gathering. Dr. Pritzker presented on creativity in education and Dr. Richards discussed the relationship between chaos theory and creativity (also referred to at the conference as “the science of change and surprise”). Other keynote speakers included Professor Robert and Dr. Michele Root-Bernstein, co-authors of Sparks of Genius, The 13 Thinking Tools of the World’s Most Creative People (Houghton Mifflin, 1999), and Arthur Cropley, author of Creativity and Education and Learning: A Guide for Teachers and Educators (Routledge, 2012). Dr. Richards noted that the Challenge was about art in every corner of life and academia, going beyond traditional domains and fields of study. “In many ways, this was a global triumph for creativity…This was about changing education to fully and deeply embody creative approaches to learning, living and being, and to helping our world to live in harmony,” she said. On the heels of keynoting the Creativity Challenge, Dr. Richards announced that she has accepted a new book deal with the Palgrave Macmillan publishing company to write the forthcoming text, Everyday Creativity and the Healthy Mind. It is about individual and social health, and will reflect upon deeper meaning, fuller living, and a better world.